My wife love it. She said: I draw compliments every time a wear it. Looks better than in the picture. Beautiful! The picture does not do it justice. Casual or dressy, Tee shirt or sweater, greens or blues it is the go to piece. Love it! This is a beautifully colored necklace. it looks better in person than in the photo. I had thought it would have darker "veins" throughout the green color, but not so. If you like green, I recommend this necklace! At last! The natural wisdom of the Earth can be clasped in your hands! The legendary mines of Israel's King Solomon were supposedly in fabled Ophir, hidden deep in Zimbabwe. But in 2013, a research team found evidence of mines from Solomon's era very close by, in Israel's Timna Valley. Historically, eilat was also mined in the region, near the Gulf of Aqaba, at a location locally known as... the mines of King Solomon. Eilat is another term for the vibrant blue and green gems we now call chrysocolla, a colorful gemstone found in both gold and copper mines, such as Solomon's. The stone is so delicate and rare, that when a deposit is uncovered, all other work in the mine stops. Extracting the beautiful chrysocolla becomes job one. 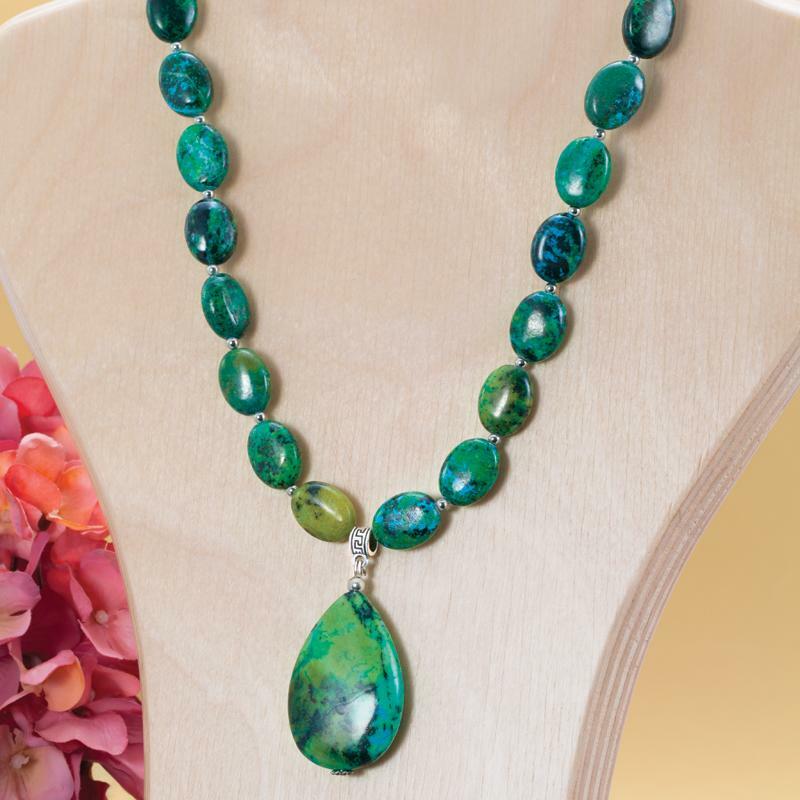 Our magnificently enhanced Earth & Sea Chrysocolla Necklace is comprised of 24 chrysocolla ovals that meet at a large, resplendent teardrop. The 18" strand boasts 325-carats of enhanced, vivid blue and green brilliance. These are gemstones whose brilliant, variegated colors reflect the play of sunlight on the sea; whose bright blue and black veins give the appearance of rivers and terrain, as though they are tiny Earths as seen from space. Delicately mined by hand, these gemstones are so valuable that the most extreme care is taken to dig out the chrysocolla without harming the whole deposit. We well know the worth of ancient, beauty and we're proud to bring you such wondrous gemstones from inner earth that reflects the grandeur of the jewel that is our home in the cosmos. The real secret of Solomon can now be yours and at a price that's down to Earth.